My name is Carlos Diaz Rivadeyra and I am a worker and assistant coordinator at El Centro de Jornaleros de Harbor City. What is El Centro de Jornaleros de Harbor City? It is a community center where anyone can seek work. Everyone has the opportunity and we don't ask about status or background. People and employers can come to the center and hire those who are seeking employment. This is the longest running day-labor center in the nation and has been active for over thirty years. What type of work does the center offer? Wages are negotiated by the worker and the employer at the center. The skill and time required for a job help determine the wages. Coordinators at the site guarantee workers are paid by logging the contact information and license plate number of employers. How is the center's relationship with the local community? We really try to improve our community and the workers at the center volunteer through IDEPSCA. IDEPSCA is a non-profit which administers the site. We have helped clean different cities and helped churches. We try to help any organization that needs our help. We also work to beautify our city. For example, we helped La Sagrada Famila Church of Wilmington load and unload donated items. We helped Cleaner Wilmington, led by Salvador Lara, plant trees around the city. 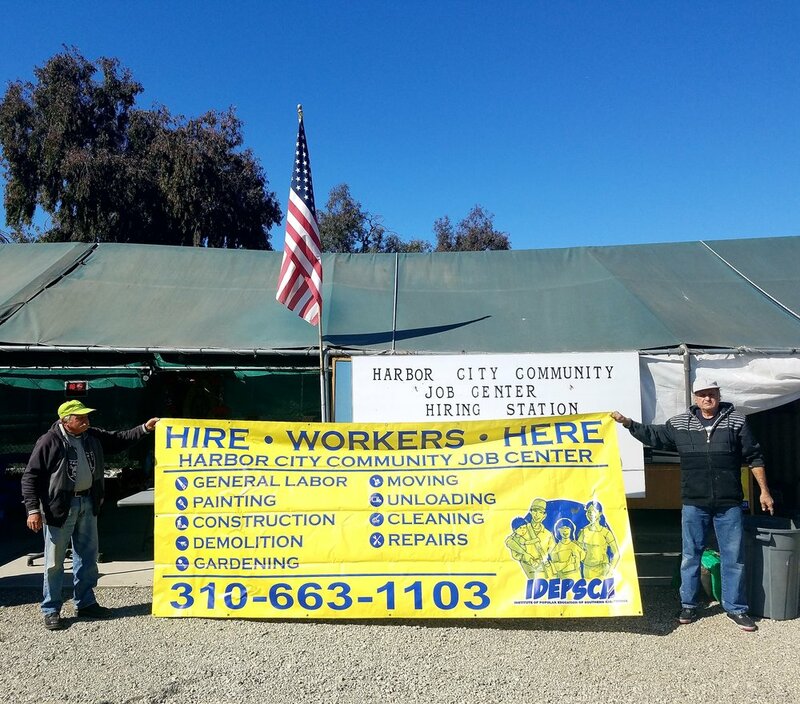 I would like to mention that Harbor City has donated tools, tarps, and other items. Pastor Lee comes on Saturdays to lead worship and brings breakfast. And Santa Margarita Church of Lomita has helped us in many ways. Rolling Hills Covenant Church has provided training and certification for workers who want to learn welding. About 10 workers have graduated from the program. They have done a lot for us and we are grateful. IDEPSCA also helps train and certify workers. They work with the UCLA Labor Center to help us. The National Day Laborer Organizing Network has helped us become certified by the Occupational Safety and Health Administration for "Construction and Safety Help." We received training and certification through California State University at Dominguez Hills. NDLOAN has also helped print poster, fliers, and signs to promote our site. Do you believe Chicanos have a responsibility to help? Not just Chicanos. We accept all forms of help because there is a lot of need. The center wants to install solar panels for our basic needs because we don't have electricity or running water. We use a gas generator to power the coffee maker and some tools. By informing local politicians of our needs. By providing certification and permits to the workers. It also depends on the ability of volunteers. They can come visit us anytime to discuss how they can help. Also, by donating coffee, sugar, and cream. The workers get up very early in the morning when it is cold. And you can see, we are outdoors and at the mercy of the weather. We are open from 6:00 a.m. to 3:00 p.m. everyday. Is there a lot of immigrants who come seek work here? Yes, but there are also many American citizens. There have been people here from El Salvador, Mexico, Guatemala, Hawaii, Czechoslovakia, the Middle East. The center is not just for Latinos. We are open to everyone.